A common pitfall however, is acquiring the newest technologies for the sake of having the latest and greatest (easy to see with the release of any new iPhone when it hits the market). The purpose of incorporating something new should have a focus on giving companies a competitive advantage. So, let’s take a close look at the Woices App, and see if it makes sense for Your Company to make the investment! Firstly, the Woices App provides an unprecedented means of Compliance Reporting. Think your company doesn’t have a problem with compliance, harassment, or a few bad apples in the basket? Hopefully, you’re right, however the stats steer the conversation in an alarming direction. 85% of employees report harassment in the workplace. Of those that are harassed, an unbelievable 75% don’t report the incident. Finally, and perhaps the most upsetting, of those who do report, 75% face retaliation (US Equal Employment Opportunity Study, 2016). 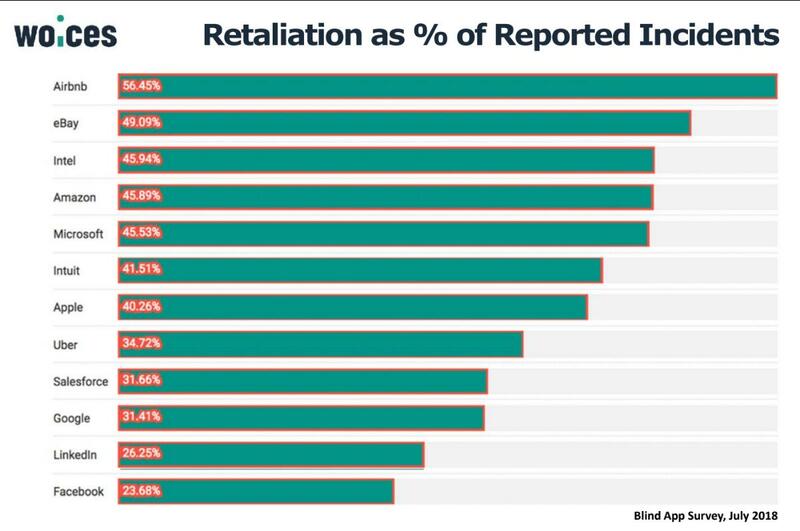 According to a study by Blind in July of 2018, 25-56% of “reported” cases (which are a small number to begin with) are retaliated against – and all this happening in “poster child companies of Silicon Valley. The funnel effect becomes obvious. While MANY are being harassed, FEW report it, because of the fear of retaliation. Not only is the lack of reporting fostered by this fear, it is also due to embarrassment by the victim, and in many cases, simply not having a viable route within an organization to report the incident. This lack of a viable communication chain is even more pronounced in smaller businesses, where the owner often plays the role of COO, the head of HR, and everything in between. The Woices App provides a safe path to report incidents without fear of retaliation. The app utilizes a unique method of cloaking that no other app has. This ability for true anonymity facilitates communication with management and eliminates fear, hesitation and embarrassment. Once employees are trained on the simple and intuitive app, they have an unobstructed, safe lane of reporting. Secondly, the Woices App encourages Engagement. Employees are given the opportunity to make suggestions, give feedback and share ideas freely. This communication can again be completely anonymous (if desired) and bridges the gap between employees and management in an instant and direct line of messaging. The Woices Admin Interface has a completely customizable phone book and gives authorization for staff to use the app and report to selected members within the organization. By fostering employee engagement a company is directly supporting an environment of belonging to the culture. This is invaluable to retaining the best employees around and making them feel vested in the actual company. Everyone needs to be heard to feel valued. Finally, the Woices App provides a wealth of insight into a company, its workforce, and its pulse. Data is power; without it, CEO’s are really just guessing about what’s actually going on at the ground floor. The Woices Dashboard provides a quick means to view reports, manage messages and setup notifications. A recent partnership with AI research lab 55B, based out of San Francisco, expands on this capability significantly with its product Codey. So now, Artificial Intelligence and Deep Learning algorithms on collected data enables organizations to identify patterns and derive practical recommendations out of that data. This allows organizations to understand their employees better, retain talent and attract new talent. Patterns of behavior are detected for preemptive action while real data can be formulated on employee feedback/suggestions/ideas. This comes down to harnessing and refining work practices to enhance a positive work culture and continually improve processes. It also gives Human Resources a clear picture of what’s working, what’s not, and what needs to change. On a larger scale, the app can be leveraged to accumulate and synthesize data for better business decisions, along with giving firm data to potential outside investors. Scaling, growth, product development and a differentiating competitive advantage are contingent on the free flow of information uninhibited by fear and stifled communication. It pays to have a finger on the pulse of your most valuable asset – your employees. Capturing this true employee sentiment data is vital to a thriving work atmosphere. A key finding on Culture Transformation from an extensive study that included survey data from more than 6,000 organizations around the world revealed how regular insight into internal and external sentiment is a much more powerful measure of Culture health than traditional engagement surveys. Compliance. Engagement. Insight. The Woices App provides companies with all of these. So let’s ask the question again - is it worth it? Definitely!